Garage Sale & Camp T-Shirts! I can’t believe that the garage sale is over! After 4 days of tirelessly working, it’s over and guess what God did…..He provided us with MORE than the amount of money we needed for our next Gladney payment! God is so good and faithful to provide. I can’t even begin to thank everyone who worked so hard to make it happen. Yesterday in church it just hit me and I cried my eyes out just thanking Him for such wonderful community. So many people did so many things so selflessly to help. Dropping off items, helping me set up, helping clean up, helping sell, baking things, buying T-shirts, telling their friends, gosh the list goes on! It was truly a God thing. We are so so humbled by the love and support that our friends have given! Although it was pretty tiring (especially without caffeine!) it was fun! Getting to chat with friends, get up early to hang signs, be freezing cold in April, Saturday Stephen rented a jumpy thing and our house became a big party! We had lots of friends stop by to buy shirts & shop and I know their kiddos had fun! It was an amazing weekend. So many people getting to be a part of HIS story, and what He’s doing though our little family. We are beyond blessed. Thank you Jesus for the gift of community! We love you all! Update: I forgot to tell you about my precious Fanous boys! Jennie, their mom, is a good friend of mine from my Trinity days and her boys are my loves. Jude, the youngest, is my main man. He’s 5. Anyway, she called me because she read the blog and wanted to help with the garage sale. So she talked to her boys and they decided they wanted to do a lemonade stand at the garage sale! Note: I got a text one morning from Jennie that said this, “I just read your blog post “why Ethiopia” to my boys (through tears) because they wanted to know why you were adopting from there. Luke said (her oldest boy), “I’m giving my money to Ethiopia. And I’m going to adopt from there too”. WOW.” REALLY? How cool is that? That kids can get involved and be a part of it, be made aware of the kids all over the world that need homes. Thank you thank you Jennie for bringing your boys by all day to help! We greatly appreciate you!!! 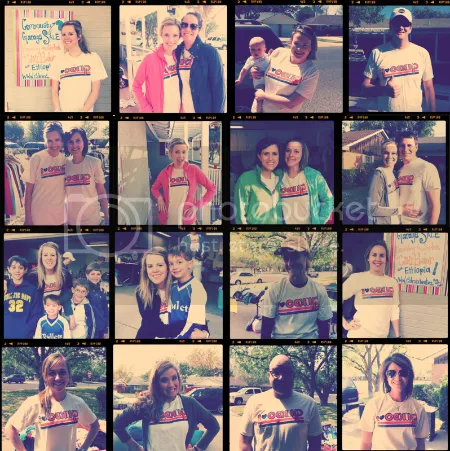 Oh and I must say, seeing people all around town sporting the Camp shirts is a huge plus! From our community group, cbs friends, neighbors, op camp friends, photographer friends, WEP clients, high schoolers — gosh it’s been so fun! I went to church Sunday and sweet April was wearing hers and she texted me a picture later that ngiht that said “my favorite: April texted me & said “just met a girl I don’t know that is wearing your shirt. They are everywhere!!!! Yall are totally bonding all of Midland” Midland born musician (and local celebrity, let’s face it) David Dunn heard the story & bought a shirt and this is the email I got from him “I got the shirt Wynne and its spectacular. I’m playing in front of over 10,000 people this weekend in houston and im going to wear it :)” That makes me happy! If you haven’t heard of David, you can check him out here and buy his EP on iTunes. Thank you thank you friends for buying shirts, wearing them, and telling HIS story! We WILL make JESUS famous! Love yall! Wynne! This is so awesome that you guys are adopting! I am so excited for you, miss you, and love being able to keep up with you via your blog!